GIGABTYE has put a lot of effort into it’s flagship motherboard and the results are showing. 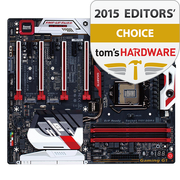 After collecting the Recommended award from Anandtech and the Must Have Editor’s Choice from TweakTown, it is now from non other than Tom’s Hardware that the Gaming G1 receives the 2015 Editor’s Choice!! Wow that’s amazing that Gigabyte won the people’s choice award. It was well deserved because a lot of effort was put into its manufacture and different innovation. It is one of the best technological inventions.